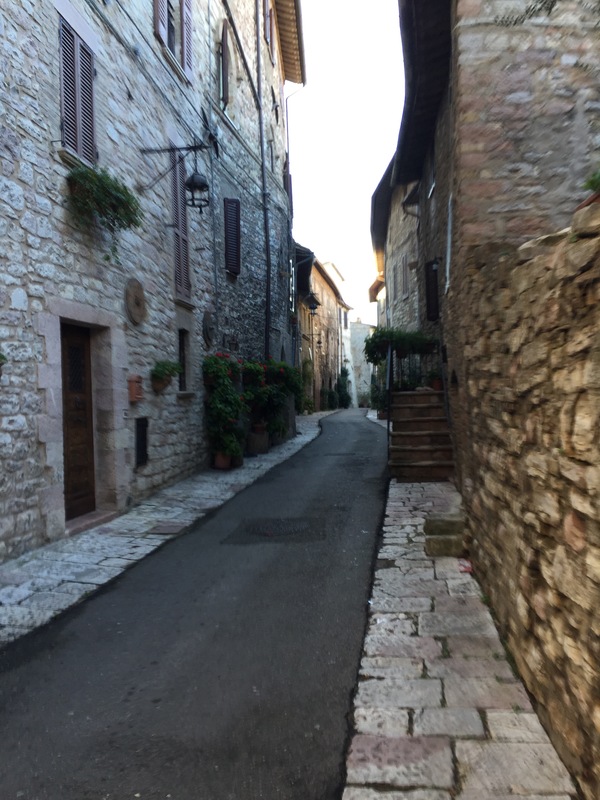 The medieval streets of Assisi are no doubt cleaner than they were in 1181 or 1182 when the boy who became St. Francis was born. But the ancient stone buildings and streets would probably look much the same to him today. His life story is fairly well documented, although of course many legends have grown up around the historical figure. Francis was raised as a rich boy, the son of a successful cloth merchant. He went off to war as a young man and was taken prisoner for a year. At some point after his return, he experienced a religious awakening which annoyed his father to no end. The house where Francis grew up still stands, and the cloth warehouse where his father expected him to carry on the family business. The story goes that at one point, his father placed him on house arrest in a tiny room, which still exists, complete with a model of the young Francis. Eventually, Francis left parents, home, and even the clothes on his back. He went off to live as a beggar and itinerant preacher. He soon attracted many followers and received official Papal permission to found a religious order. His followers lived alongside the poor people they served. They went barefoot or wore sandals, and dressed in plain rough habits. Their rope belts had three knots, signifying poverty, chastity and obedience. 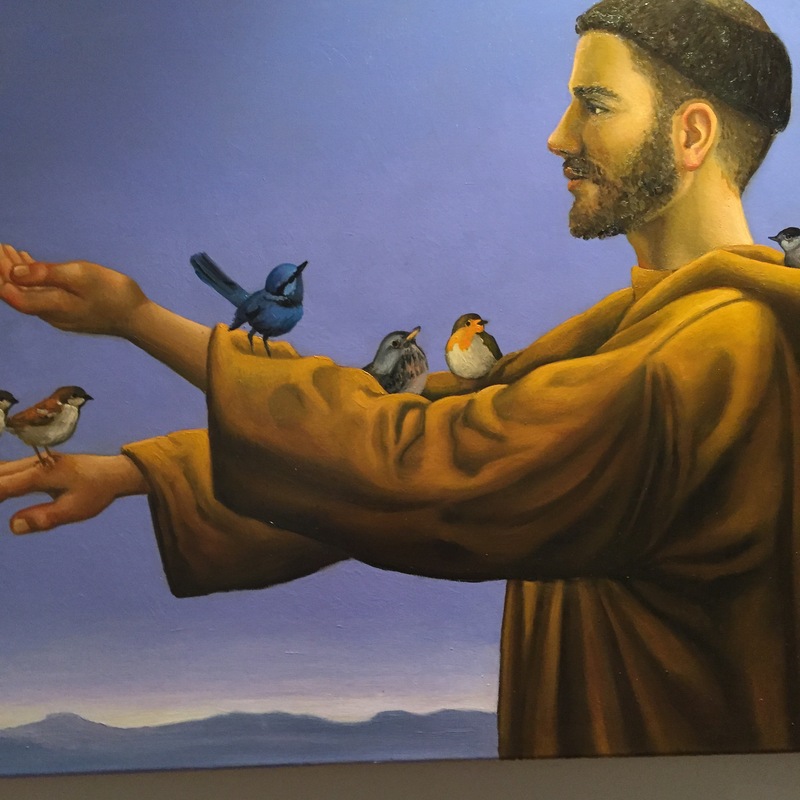 Francis famously loved nature; he was said to preach to flocks of birds, who listened intently. He was an environmentalist at a time when humans were intent on exploiting nature as much as possible for their own gain (sounds familiar, doesn’t it?) Francis was also a great peacemaker, constantly trying to get enemies to reconcile. In his time as in ours, peace was elusive. 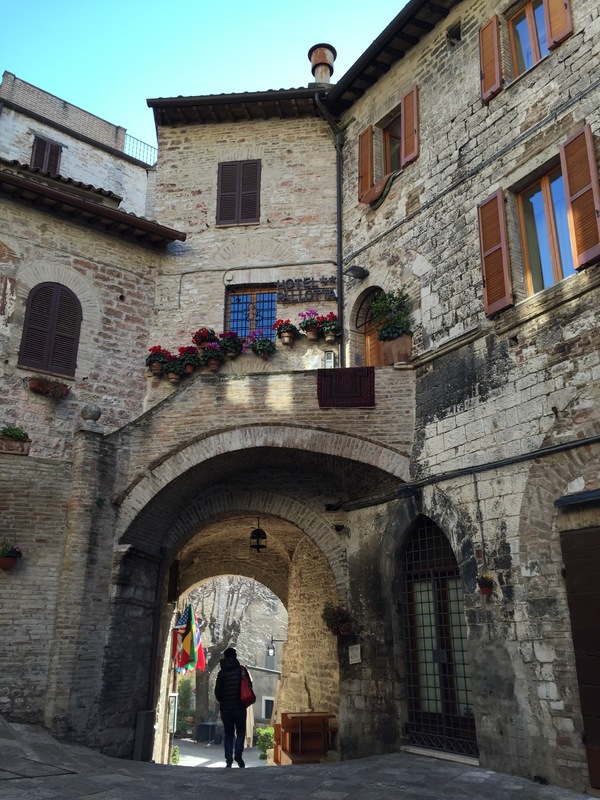 Assisi is not overrun with tourists, although there are plenty of visitors. Are there tacky souvenirs? Sure, but it’s all pretty tasteful and low-key. 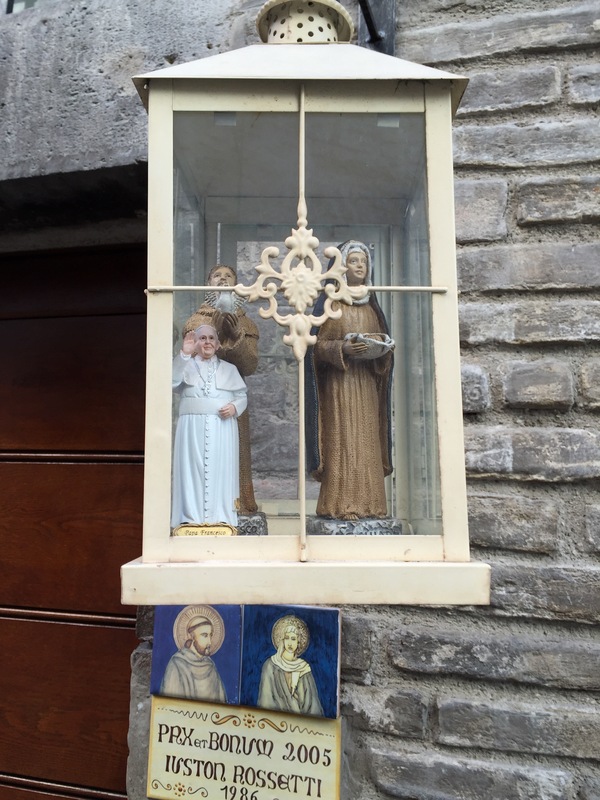 I liked this lantern beside someone’s doorway: St. Francis, his friend St. Clare, and the present Pope all cheerfully greeting passersby. 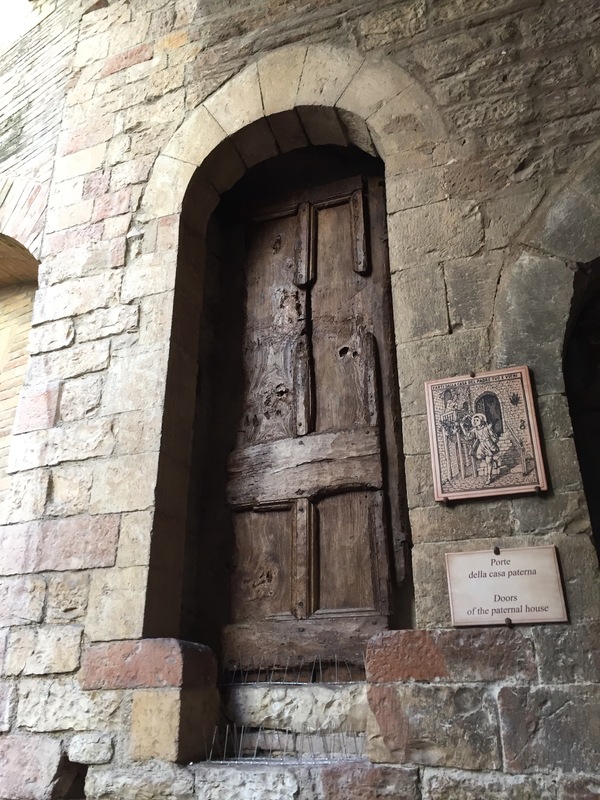 Even outside the many historic churches in and around the town, Assisi has a spiritual feel. In other tourist destinations in Italy, people run around with selfie sticks, trying to capture their smiling faces in front of landmarks. 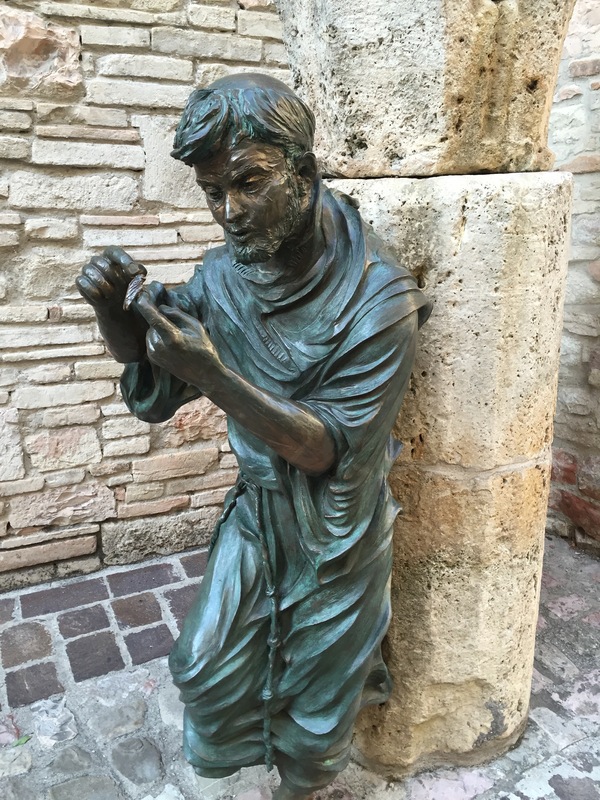 In Assisi, I didn’t see a single selfie stick. Instead, I believe I saw many people quietly looking within themselves, measuring their lives in light of the example set by Francis. This entry was posted in Uncategorized on December 6, 2015 by Claudia Suzan Carley. 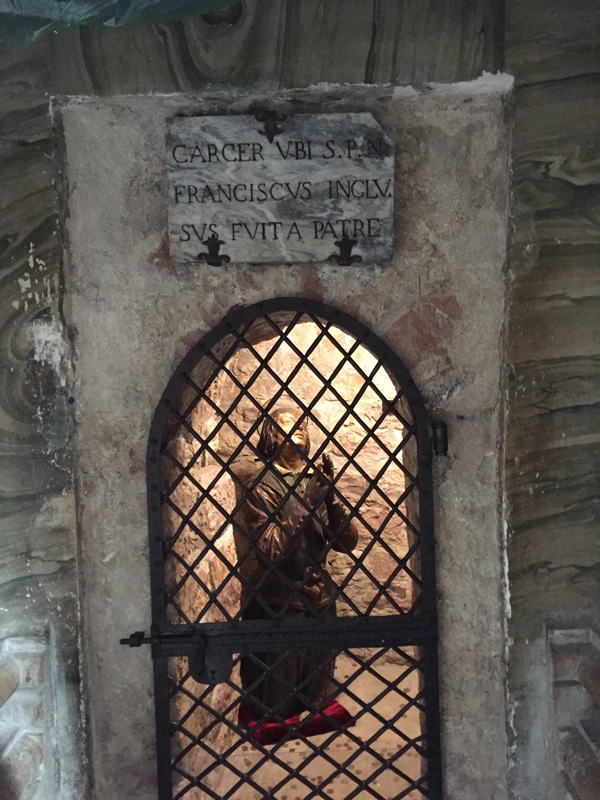 Thank you so much for taking me to the home of St. Francis Assisi via your blog. I have enjoyed these posts so much. I have had a burgeoning interest in St. Francis’ teachings and philosophies since my son went to college at DeSales University formerly known as Allentown College of Saint Francis de Sales. Thank you! It is impossible not to love Francis and Assisi. We need him and his ideas right now. Wonderful words and great pics. Your photos are spiritual and carry a sense of this saint who is revered by Catholic and non-Catholic alike. Thank you! The message of Francis is so simple and so much needed in the world right now. It seems that even non-religious people can find inspiration in Francis and in Assisi.